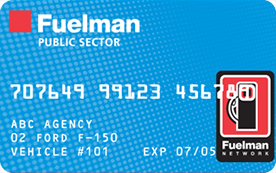 The Fuelman Public Sector Fleet Card was designed with government and non-profit entities in mind. If you are looking for easy tax reporting while benefiting from discounts offered throughout the Fuelman Network, this card is for you. Save up to 5¢ on retail fuel prices per gallon at one of 50,000 commercial fuel and 20,000 maintenance locations nationwide. Build your fleet on trust and responsibility. Restrict card purchasing to fuel only or fuel and maintenance only and control fraud by tracking real-time transactions. Set custom purchase limits by type of fuel, time of day, date and gallons and be alerted by email with any exemptions. Save time and peace of mind with online account management and consolidated billing. Receive one report that details transaction by driver, vehicle, and department. Download into convenient Microsoft® Excel format. Fuelman representatives are ready to assist with account set up so you can start saving immediately. *Volume Tier rebate schedule based on monthly billing cycle and capped at 14,000 monthly gallons; schedule pro-rated for weekly and bi-weekly billing cycles. Actual savings vary based on the number of unleaded and diesel grade gallons purchased during applicable billing cycle. Rebate is not available on purchases at The Convenience Network brands including Loves, Chevron/Texaco, Arco, Sinclair and Walmart/Sam's Club. Transactions at Arco are subject to special pricing. Rebates are subject to forfeiture if account is not in good standing. Program pricing is reevaluated annually and subject to change thereafter. Program Terms and Conditions apply. Visit www.fuelman.com/terms/ for details. Fees may apply in some cases, such as for optional services, late payments and/or credit risk.Fuelman® is a registered trademark of FLEETCOR Technologies Operating Company, LLC.